The most important macro development of the past few decades has been the banishing of inflation from the center of the international economy. In the United States, we know that Volcker’s draconian policy measures were decisive in bringing down inflation from its 1980 peak of slightly over 12% to under 4% by 1983. But the Fed has been extraordinarily accommodative since at least 2000, yet core inflation has been under 3% since 1995. What accounts for this startling fact? In standard macroeconomic textbooks, the general price level is determined by the money supply. Broadly speaking, the rate of inflation equals the difference between the rate of growth of the money supply on the one hand, and the rate of growth of real output on the other. This basic picture is adjusted when there is an ‘output gap’ captured by the concept of the ‘natural rate of unemployment’—in the technical jargon, the non-accelerating inflation rate of unemployment (NAIRU)—defined as the level of unemployment consistent with stable inflation. The GDP equivalent of full employment is the absence of an output gap. Excess demand bids up the price level and increases inflation; deficient demand likewise results in lower inflation. Note that this refinement is contingent on monetary accommodation: you can’t have high inflation unless the supply of money grows rapidly. The standard model fails miserably in making sense of the past twenty years. Not only does it fail to predict the magnitude of the decline in inflation; much more damningly, it gets the direction of the movement wrong. In light of the extraordinarily accommodative monetary policy, it predicts rapidly accelerating inflation. What, then, accounts for inflation’s vanishing act? And why does the standard model fail so miserably? The argument that central bank discipline is responsible in not persuasive on two grounds. First, inflation has been tamed not just in the United States and not just in the core of the world economy, but globally: world-wide inflation has declined from double digits to around 4% over the past twenty years. Therefore, central banks’ institutional learning can hardly be said to provide an efficient explanation. Second, and fatally, center countries’ monetary policies during the past twenty years can hardly be described as restrained. Any good explanation must account for the global nature of the phenomena and the failure of ultra-loose monetary policy to unleash inflation. Back in 2003, Kenneth Rogoff argued that globalization is to blame. Specifically, he argued that “the most important and most universal factor supporting world-wide disinflation has been the mutually reinforcing mix of deregulation and globalization, and the consequent significant reduction in monopoly pricing power.” He is right about globalization but wrong about the mechanism. Inter-firm competition in product markets for tradable goods and services, whether national, through deregulation, or international, through increasing trade openness has indeed been responsible for disinflation in the periphery, but this is not the case in the core of the world economy. Rather, I will argue that the explanation for disinflation in the core of the world economy has to be sought inside firms. Specifically, the unbundling of firms’ supply chains allowed them to pit national labor pools against each other, sharply reducing their ability to bargain for higher wages, and thereby short-circuiting the central mechanism that drives persistent inflation. 1. Wage inflation is the principal driver of persistent inflation. This is in fact the key premise of the concept of the non-accelerating inflation rate of unemployment (NAIRU). 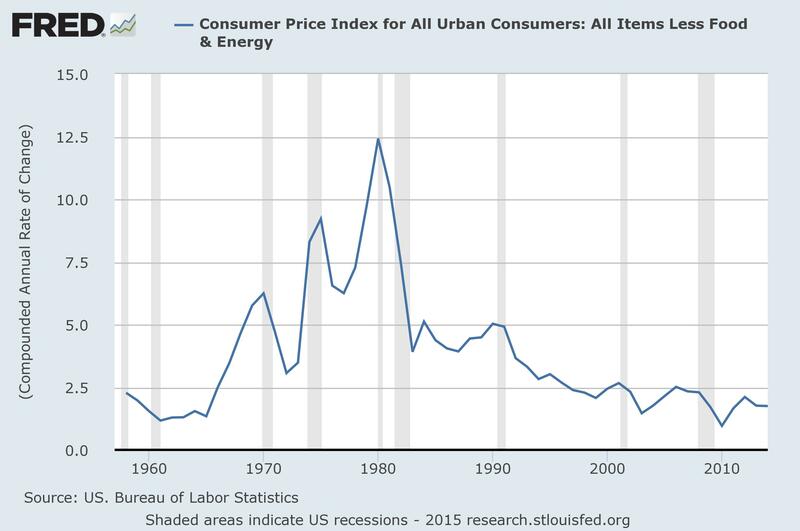 Business cannot raise prices without a significant growth in consumers’ purchasing power. Unless the Federal Reserve sends cash-strapped consumers a check in the mail, consumers can only increase their spending on goods and services by becoming ever more indebted. But there are inherent limits to credit-fuelled expansion in consumer spending: it is not enough to generate significant inflationary pressures. Persistent inflation is well-nigh impossible without a sustained rise in nominal wages. 2. The Federal Reserve does not control the money supply. This may come as a shock since in both macroeconomic theory and common parlance, the Fed can choose to expand the stock of money at will. But this is a fallacy. It is the banks who create money out of thin air. When you apply for an auto loan, your bank makes an accounting entry on its books showing that you owe it $20,000 and debits $20,000 to your account enabling you to buy the car. To be quite clear: the bank loaned you $20,000 that did not hitherto exist. It is therefore clear that the amount of nominal dollars floating around depends on general credit conditions; crucially, it depends on borrowers’ ability to borrow and lenders’ ability to lend. The Fed merely manipulates the constraints on banks to lend by manipulating the federal funds market. The federal funds market is only the last resort for banks who satisfy the bulk of their funding needs through the repo market and the offshore market in eurodollar bank deposits. In fact, the reality is even more sobering. What we have is a ‘market-based credit system’ in which the money supply emerges from a complex interaction of the monetary authorities, the behaviour of banks and shadow-banks, and general credit conditions. The Fed can hardly be described as quarterbacking the operation, much less choosing the money supply. 3. Credit expansion in the absence of any significant growth in wages is, and can only be, absorbed in the asset markets. The reason is straightforward. In light of their depressed incomes, people’s capacity to borrow is inherently limited. Books may be fudged for a while and subprime lending expanded but sooner or later this process will reach its limit. Unless, of course, there is an asset price boom that raises the value of the collateral on which lending can expand. Both of these dynamics were in play before the financial crisis. More generally, extraordinarily accommodative monetary policy buoys up the price of risky assets by prompting a ‘search for yield’ by asset managers. Credit expansion thus gets channeled into rising asset prices. 4. The collapse of wage inflation in the 2000s can be traced directly to the ‘second unbundling’ of firms’ supply chains. In particular, the addition of hundreds of millions of Asian workers to the global labor pool undercut the bargaining power of workers in the core of the world economy. Relocating processes in the periphery not only reduced the production costs of global firms directly but also increased their bargaining power against unions back home. The competitive pressure identified by Rogoff worked not so much through reduced monopoly pricing power but rather by forcing firms to adopt cost-competitive supply chains. In fact, it worked to increase their monopsony power in national labor markets.. Schwerhoff and Sy (2010) identify a second mechanism: competitive pressures unleashed by the ‘second unbundling’ served to eliminate the least productive firms, thereby reducing average costs, which in turn promoted disinflation. The strongest piece of evidence against Rogoff’s mechanism is that if intensifying inter-firm competition were in fact is responsible for disinflation then the profit rates of global firms would show a marked decline as well. This is quite the opposite of what has obtained. 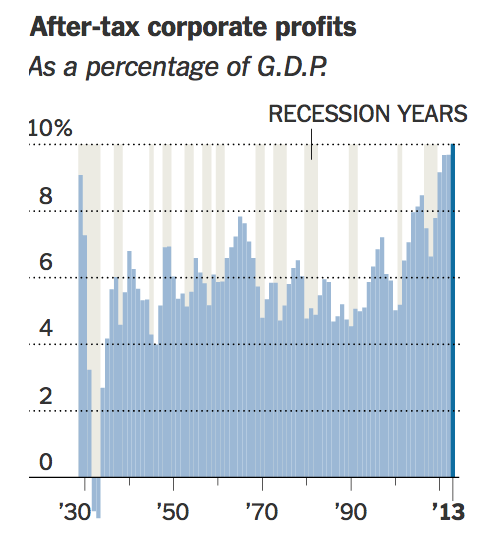 New York Times reported last year that corporate profits were at their the highest level in 85 years. There is no sign of cut-throat inter-firm competition to be found. It is also clear why the standard textbook model fails so miserably. The central mechanism through which loose monetary policy is translated into inflation, i.e., wage inflation, does not work as advertised due to the economics of global supply chains. In the absence of wage gains, the modern ‘market-based credit system’ channels the Fed’s monetary expansion into asset markets.